Thank you P.F. Chang’s for sponsoring today’s discussion and for the tasty date night! Mathew and I have had incredibly busy schedules the past 2 weeks. We went on a babymoon to Lakeway Resort and Spa in Austin, stayed at the Hotel Derek in Houston a couple days later so we could go to Texas Children’s for our fetal MRI on Addison, and just a couple days after that found ourselves in Dallas for the night at P.F. Changs. We vowed after Houston that we wouldn’t be traveling any more until Addison arrived, but somehow I was able to convince Mathew to take me on one last big date night at P.F. 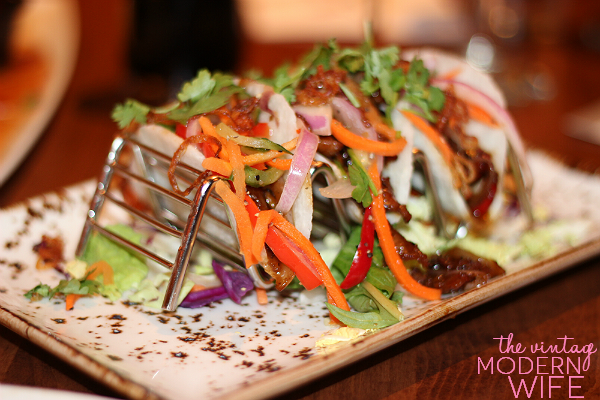 Chang’s to try out their new Small Plates and their Wine Flights menu items that are exclusive to Dallas locations. Mathew had never been to P.F. Changs, and I’d only been once before, so although he was hesitant to drive to Dallas on a weeknight, he took me. We arrived at the Arlington Highlands location and didn’t have to wait at all to get seated. I am SO thankful for that because we’d gotten there a little after 8 and were SO hungry. Mathew will even tell you that he got pretty hangry on me. Um, aren’t I supposed to be the crazy, hormonal one? We were greeted by our awesome server, Ashlyn, and the manager, Elroy. Can I brag about them? They were AWESOME and made sure we loved everything. Ashlyn was incredibly knowledgeable and told us all about the Wine Flights menu. Since I’m the pregnant one, Mathew decided to try the Small Bites and Wine Flights, and I had my eye on a couple of the new small plates on the menu. We didn’t have to wait long at ALL (maybe 5 minutes) and all of our food started coming out to the table. I’m not going to lie- our whole table was COVERED in food- it was a pregnant lady’s dream. 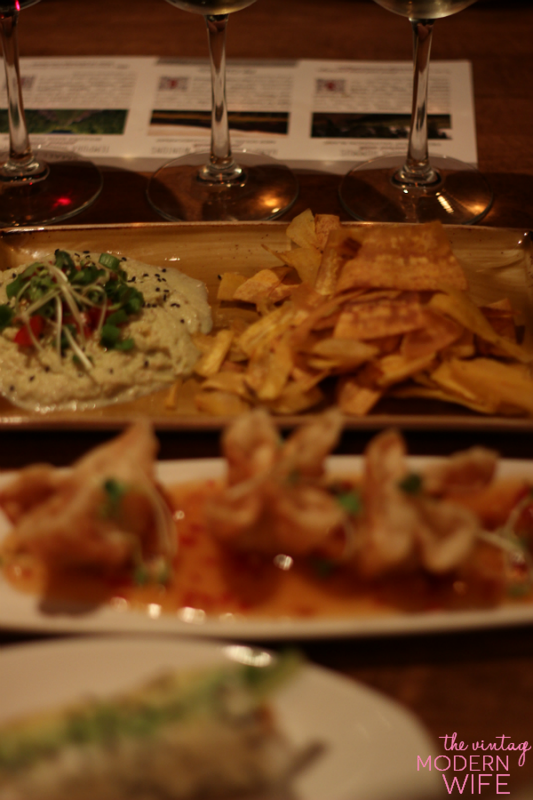 The Small Bites and Wine Flights included Edamame Hummus served with crisp plantain chips, crunchy and creamy Crab Wontons, and a spicy Tempura Shrimp Hand Roll. Each of the 3 “bites” came with a glass of wine that Mathew said were paired PERFECTLY. He’s kind of a wine snob because he used to taste and sell wines when he worked at H-E-B, and said, “Whoever created this KNEW what they were doing.” Um, duh! His Small Bites and Wine Flights also came with a paper that talked about the food and wine pairings, and Ashlyn informed us that there were QR codes on the paper so we could learn even MORE about the wine pairings. I’m a technology nerd, so that made me excited! I also ordered Handmade Pork Dumplings (not pictured) and these delicious Jicama Pork Tacos (above) to add to our tasting. We just chatted, shared the 5 plates tapas style, and agreed that this was some of the best food we’d had at a chain restaurant! 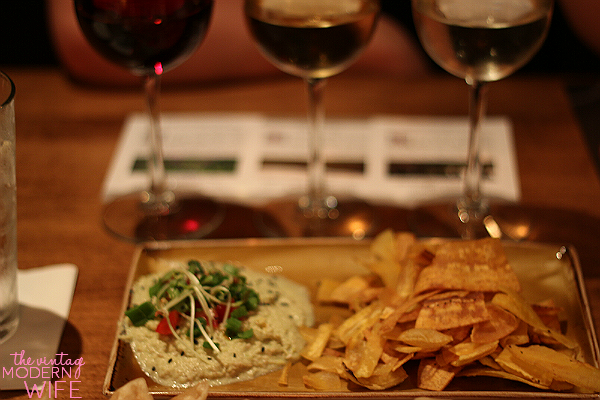 My particular favorite was the Edamame Hummus with the plantains. I enjoy hummus from time to time, and I like the occasional edamame with my dinner, but oh my GOSH it was DELICIOUS. P.F. Chang’s twist on hummus is a signature blend of fresh edamame, sesame seeds, ginger and a hint of chili. I kept telling Mathew it was “terrible” so he would let me eat it, but he wasn’t buying it. Did you see my excitement about it on Instagram? We literally cleaned off EVERY plate on our table, and ordered a Vietnamese Cinnamon latte from their new Lattes On The Go menu, and were practically converted from Starbucks fans to P.F. Chang’s latte fans. HOLY COW! I’m not lying- it was SO good, and went amazingly with the Banana Spring Rolls we ordered for dessert. Everything was delicious and we were thrilled that it all came out pretty fast. It’s not often that we travel somewhere JUST for dinner, but this was well worth it. It was so worth it, in fact, that when we left, Mathew said “Ok I have something to say to you….you were RIGHT.” P.F. Chang’s for the win! The contest will run from July 29th through September 15th. A winner will be chosen at the end of the campaign. Each participant will have the opportunity to win a 4-course pairing dinner including new small plates and sushi for 8. Participants must be 21 or over to enter. To enter, visit the P.F. Chang’s contest page and submit an original fortune sharing your love for happy hour. All in all we had a wonderful Wednesday Date Night at P.F. 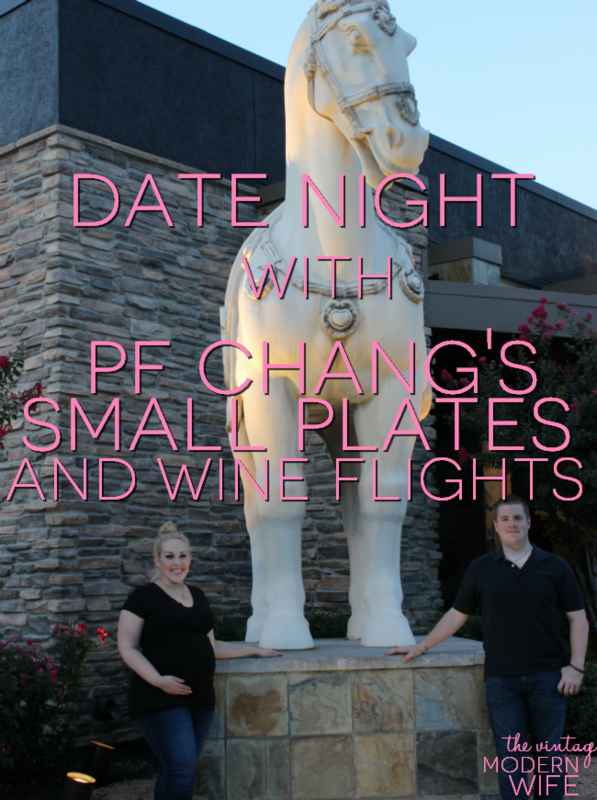 Chang’s for their Small Plates and Wine Flights. With amazing food, wonderful staff, and a cute husband, I had a great night. If you’re in the Dallas area, go check out the new P.F. 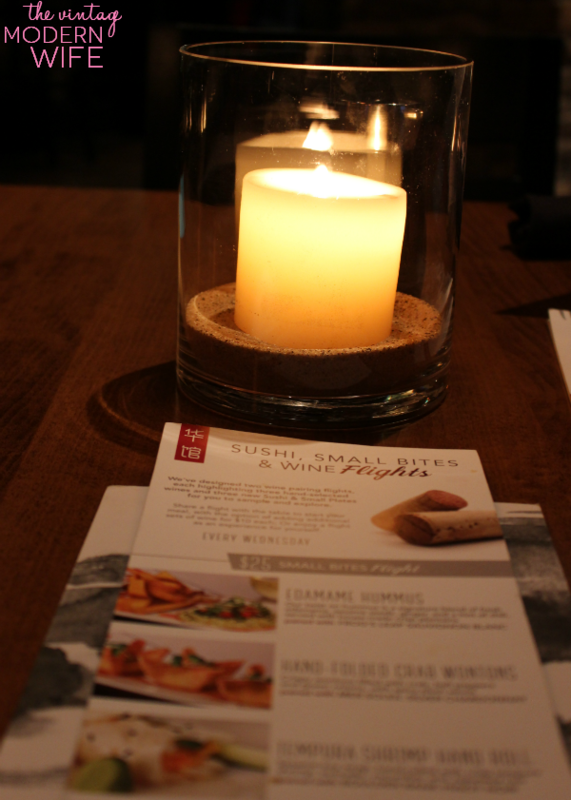 Chang’s menu items on Wednesday nights! Last week, Mathew and I went on the silliest date we’ve ever had. At least…we FELT silly. Heck, we felt STUPID. But- it was SO. MUCH. FUN. 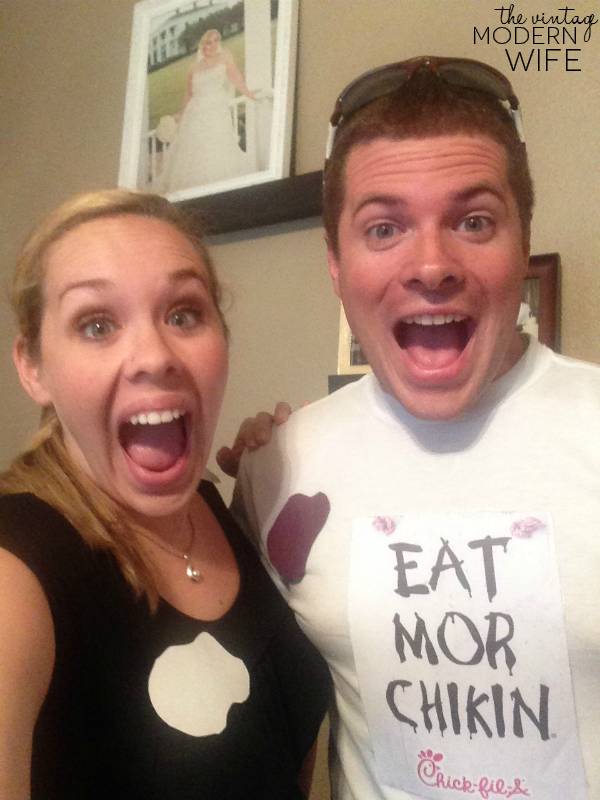 We dressed up for Cow Appreciation Day and totally loved it. If you’re not familiar with it, Cow Appreciation Day is held every year by Chick-Fil-A, and you can dress up for a free meal that day! There are some rules to Cow Appreciation Day- you have to be “fully dressed [like a cow]” to get a whole meal free, and if you’re only “partially dressed [like a cow]” then you just get a free entree. 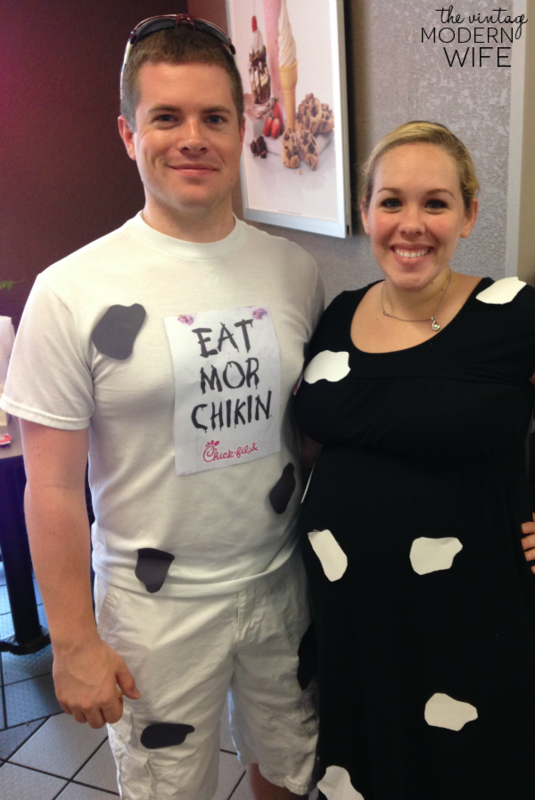 I’ve actually eaten at Chick-Fil-A previous years on Cow Appreciation Day, but had no idea what was going on. Of course, I laughed at the people all dressed up for free food, but I’m sure they were laughing at me because I actually had to PAY for my food. Touche people…touche. I’d felt absolutely awful all day because I hadn’t slept the night before due to crazy itchy palms and feet. Turns out, I have yet ANOTHER issue with my pregnancy called Cholestasis. I was running on very little sleep and had been to the lab earlier in the day to get blood work done. While I was waiting at the lab I saw a couple Facebook friends of mine get dressed up this year for Cow Appreciation Day. For some reason I thought that Mathew and I should do it. He’d had a stressful week at work, I’d had an incredibly stressful/tiring day, and we love making each other laugh, so why not? Once Mathew got home and we put our spots on, we couldn’t help but laugh at how ridiculous this all was. My paranoid husband kept asking, “Are you SURE it’s today and not yesterday?” I assured him that I was right, but even he had me doubting myself. We cracked up worrying about whether our spots were sticking on or not, or if they were evenly spaced out. You know- those are important things. I worried about whether we would be considered as “fully dressed” because we didn’t have tails, ears, or cow noses, especially after walking into Chick-Fil-A and seeing some CRAZY legit costumes. People with pink gloves as udders, REAL cow costumes from the party store, HUGE poster boards with “Eat Mor Chikin” on them…and as we waited in line, I got nervous. Yeah, nervous if my meal would be free or not. Don’t ask me why I even cared- we brought our wallets! Again, don’t mind my exhaustion, but we ended up getting our free meals for dinner, ate to our hearts’ content, and had the BEST time laughing at all the silly costumes everyone was wearing. If you can’t beat ’em, join ’em, right?! I asked some guy in a CRAZY cow get-up to take our picture for the night, and we happily headed home with full bellies. On the way home, we talked about doing this again next year, and even dressing up little Addison in a cow-painted onesie for the event. It’s funny how our mindset changed from it being a stupid, ridiculous idea, to one of the silliest dates we’ve ever had. Cow Appreciation day ended up being one of the best ideas for a laid back date, and was the perfect way to relieve our stress from the day. Have YOU ever participated in Cow Appreciation Day? Do you have more Happies or Crappies? Welcome to our 26th week of Happies and Crappies link up day! We wouldn’t have been around for so long if it wasn’t for you awesome ladies linking up, so we really appreciate you! 1. Happies and Crappies link up will be posted EVERY Friday at Midnight CST . Happies and Crappies link up was created so you could write about the happies (good) and crappies (bad) from your week! 2. We’d like for you to put our button on your post for the link up. 3. Please follow your hosts. We won’t make it mandatory, but we appreciate the love. 1. Birthday countdown = FIVE days away! I’m excited to see what birthday plans Mathew has in store for me. 2. My Italian Iced Coffee is a HUGE hit on Pinterest. It makes me so happy to be giving you content that y’all love. It makes my day! 3. I got paid this week to take our church kids to Austin Park and Pizza. They’ve got bumper boats, go karts, mini golf, arcade games, and laser tag! It was fun to play with the kids and get paid at the same time. 4. A family friend was appreciative of Mathew getting them a rental car and sent us a thank you card with two movie tickets and a $10 froyo gift card! I’m excited that we were given a free date night. 5. My classroom is finally getting some progress. I’ve gone probably about 4-5 times to work on it, but this week Hollie and I got a lot done. It’s still a huge wreck, but I’ll be taking pictures once everything is all finished! 6. 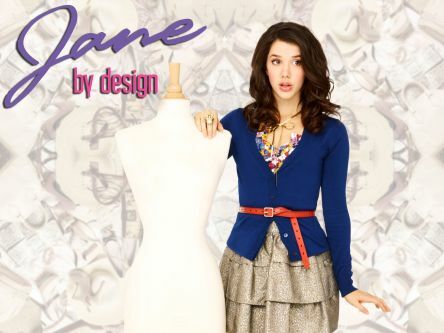 I’m SO hooked on the show Jane By Design. I just want all her clothes! 1. I feel like I haven’t gotten to spend quality time with Mathew since like 4th of July. We keep having company (which isn’t bad but ya know) or have been working so hard we’re exhausted, so I really hope our date night this weekend helps. Its been creating miscommunications between us and I hate that. 2. My phone died the other day RIGHT before a workout and I had to workout for an hour without ANY music. It was really tough but I did it. Never again though!